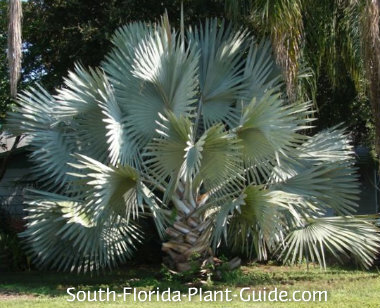 The exquisite silver bismarck palm is one of the most stunning and desired large palm trees in South Florida. The "nobilis" in its name means noble - a perfect description of this formal and massive palm. A silver bismarck needs plenty of space where its bright color and sheer size won't overwhelm the house or landscape. 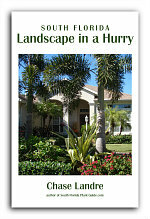 It's too much palm for a smaller property or home - making a small house appear even smaller. Genetics causes the silvery color to differ on each one. They can be steel-gray to blue-gray to silver-white...and actually have a purple hue when they're very young. The palm itself grows slowly to 30 feet or more...and each thick, fan-shaped frond can reach 10 feet in diameter. Bismarcks will grow in full sun to part shade but do best in sunniest areas. 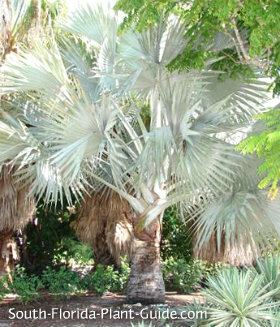 These are moderately salt-tolerant palms, drought-tolerant once established. 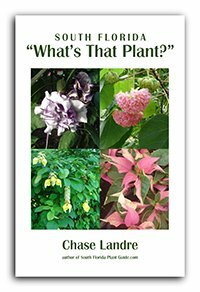 They'll thrive in warmer areas of Zone 9B and anywhere in Zone 10. Once established, bismarcks can handle some cold damage. Use top soil or organic peat moss as a soil amendment when you plant. This is not a self-cleaning palm, but it grows slowly so trimming off old fronds won't be necessary very often. If the palm sustains some winter cold damage, prune off affected fronds in spring, leaving on as many as possible for the health of the palm. 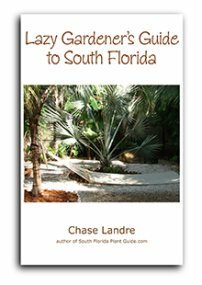 Apply a granular palm fertilizer 3 times a year - once each in spring, summer and fall. Choosing a location for a palm that gets this big takes careful planning. You'll need a planting area at least 15 to 20 feet in diameter. Your young palm may look "small" now, but get it too close to the house, drive, or walkways, and you may lose it eventually. Bismarcks don't like their root systems disturbed and often won't survive transplanting. This palm is generally too big to be a good container plant. There's basically only one...use as a very large, dominating specimen. COMPANION PLANT SUGGESTIONS: The color and texture of this palm are very striking against greens and all flower colors in other adjacent plantings. You might repeat the silver color in other areas with plants such as silver buttonwood, Texas sage or silver saw palmetto.